UH.ua Review 2019: Is UH.ua a Good Hosting? UH.ua is the self-proclaimed largest web hosting provider in Ukraine. It offers a range of shared, VPS, VDS, and dedicated server hosting. The website is in Russian and Ukrainian. Formed in 2003, UH.ua is one of Ukraine’s largest web hosting providers. It offers Unix and Windows hosting, VPS, SSD VPS, VDS, and dedicated server rentals along with domain registration. Its data center is in Keiv, Ukraine and the website is in Russian and Ukrainian. UH.ua offers both Unix and Windows shared hosting plans. 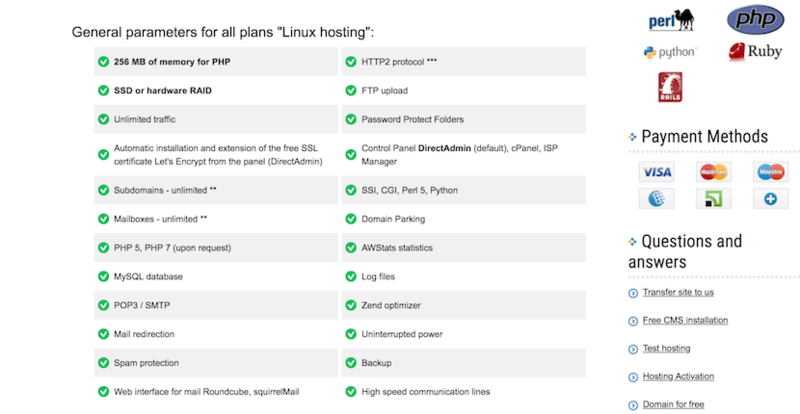 The entry-level “Kid” Unix plan includes unlimited monthly bandwidth, 7GB of storage for one website, and one MySQL database. Stepping up to the “Optimal” level, data allowances and features include unlimited bandwidth, 15GB of storage for 10 websites, and 10 MySQL databases. For customers needing Windows hosting, UH.ua’s entry-level shared Windows / ASP.NET hosting includes unlimited monthly bandwidth and 5GB of storage for one website. The more advanced, “Optimal” Windows plan includes unlimited bandwidth, 10GB of storage for 10 websites, and 10 MSSQL databases. Hosting customers will already have basic protection against HTTP flood DDoS attacks. However, VPS, VDS, and dedicated server hosting customers can also upgrade the DDoS protection for an additional monthly fee. Options range from protecting one website on up to unlimited websites on one or two IP addresses and from 5Gbps to 50Gbps. Pricing for UH.ua’s shared hosting plans is very affordable, both compared to other Ukrainian web hosts and international providers. The entry-level Unix plan costs around the price of a cappuccino per month but comes with many top-level features such as the uptime and technical support guarantees. This equates to less than half the price of many other Ukraine-based hosts. UH.ua shared hosting plans can be paid for in monthly, quarterly, semi-annual, annual, biennial, or triennial intervals (for Unix only) with discounts offered over the monthly rate – the longer the term, the higher the discount. Customer support is handled by email and ticketing on a 24/7 basis. Telephone support is available from 8:00 a.m. – 8:00 p.m. local Ukraine time. I reached out to support with a sales query and received a prompt reply that same day. UH.ua offers a service level agreement that covers its uptime guarantees and technical support response time. The standard SLA includes a guaranteed uptime of 99.95% and a one-hour technical support response time during normal business hours. It has upgraded SLAs which raise the uptime guarantee to 99.99% and 99.999%, along with a 30 or 15 minute technical support response time guarantee. 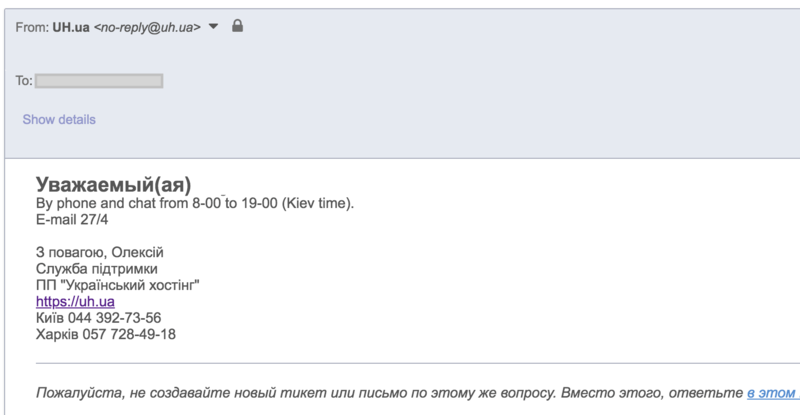 UH.ua is a Ukrainian web host that offers feature-rich hosting at very competitive prices. It includes an SLA with uptime and technical support response guarantees. Hosting plans are available month-to-month or longer, with discounts given for longer length plans, and customer service is prompt. Wondering how UH.ua stacks up against other Web Hosting companies? Enter any other Web Hosting company and we will give you a side-by-side comparison.